57,000 Business Have Posted A Sign That Have Liberals Fainting By The Truckload! The general liberal hatred of guns seems to be a relatively recent invention, namely in the last twenty years or so. Which is quite strange because it seems that every police office that a liberal will still call when they think they are being triggered all have. When I went to school, I went in a part of the country where the first tow days of hunting season was a school holiday. We used to have things like shooting sports in school physical education classes so we could have a respect for firearms and to make us realize that these things certainly were not toys. However, it seems that liberals want to dumb down the entire cultures until nobody knows how to even use one to defend themselves. There are some topics that split our country down the middle. So, when one of those topics, where people have trouble agreeing, ends up on a sign that 57,000 business within the United States have posted, it causes some people to lose their minds. Guns in America is a topic that’s hotly debated. There is not a simple “for” or “against” when it comes to guns. Even those who are “against” might believe certain professions should continue to have them while those who are “for” might feel there are some instances where it’s inappropriate to have a gun. That brings us to the sign in question. Even some of those who claim to be for the Second Amendment and the exercise of those rights, they still might not be comfortable to sit down next to an armed stranger out in public. Then, there are those of us who see this sign and applaud it as we have our own firearm holstered on our bodies but out of sight. Yes, we are talking about “Guns Welcome” signs. 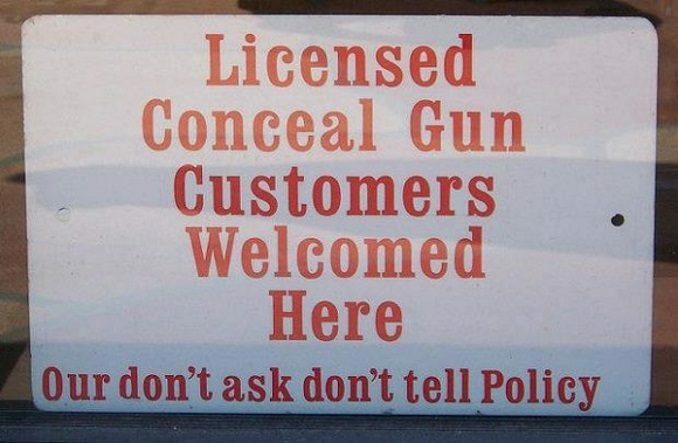 According to The Washington Times, an estimated 57,000 business have popped up within the United States which have posted “Guns Welcome” or similar signs on their front doors. Of course, there are those who applaud such sentiments, but not everyone likes that idea. In contrast, when it comes to countering such signs, gun control groups, like Moms Demand Action, have only persuaded a little over a handful of major chain businesses to ban guns from their premises in recent years, including Target, Chipotle, Jack in the Box, Starbucks, Chili’s, and Sonic.